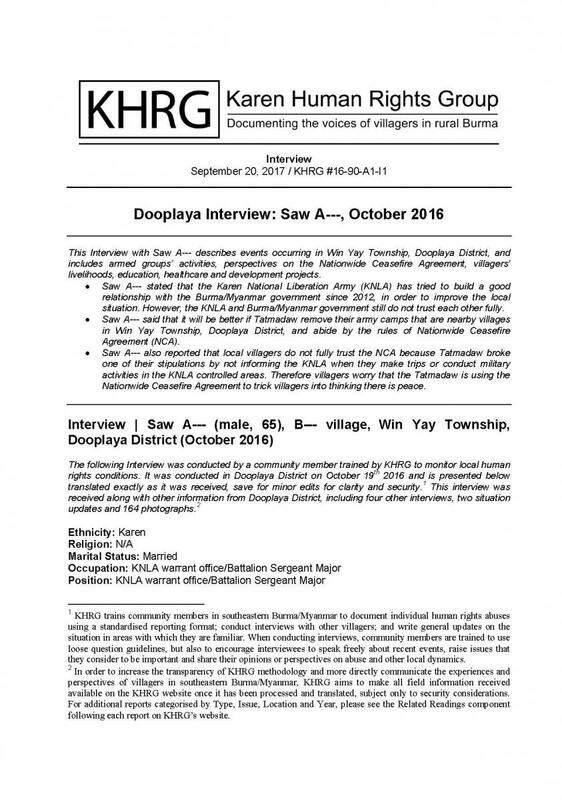 This Interview with Saw A--- describes events occurring in Win Yay Township, Dooplaya District, and includes armed groups’ activities, perspectives on the Nationwide Ceasefire Agreement, villagers’ livelihoods, education, healthcare and development projects. Saw A--- stated that the Karen National Liberation Army (KNLA) has tried to build a good relationship with the Burma/Myanmar government since 2012, in order to improve the local situation. However, the KNLA and Burma/Myanmar government still do not trust each other fully. Saw A--- said that it will be better if Tatmadaw remove their army camps that are nearby villages in Win Yay Township, Dooplaya District, and abide by the rules of Nationwide Ceasefire Agreement (NCA). Saw A--- also reported that local villagers do not fully trust the NCA because Tatmadaw broke one of their stipulations by not informing the KNLA when they make trips or conduct military activities in the KNLA controlled areas. Therefore villagers worry that the Tatmadaw is using the Nationwide Ceasefire Agreement to trick villagers into thinking there is peace. The following Interview was conducted by a community member trained by KHRG to monitor local human rights conditions. It was conducted in Dooplaya District on October 19th 2016 and is presented below translated exactly as it was received, save for minor edits for clarity and security. This interview was received along with other information from Dooplaya District, including four other interviews, two situation updates and 164 photographs. Which village do you live in? I was born in Deh Pee village. Currently, where do you live? Currently, I live in B--- village, Kya Inn [Kyainseikgyi] Township. Yes, I have a family. How many children do you have and how old is your oldest child? What is the name of your oldest child? I do not think it is necessary to tell you. My youngest child is 20 years old. So can you tell me the name of your youngest child? If you cannot tell me [the name], please tell me which Township and District you live in now. Now I live in Waw Raw (Win Yay) Township, and my duty is here. What rank are you holding now? I am serving as a Battalion Sergeant Major. What work do you do for your livelihood? I do not have any special work to do for my livelihood because I am a revolutionist [in the KNLA]. So as you are a revolutionist, can you tell me your perspectives and experiences? During the revolution [conflict], I experienced many different things. I chose to do this work [with the KNLA], so I faced many challenges but my opinion is that each challenge was good. Every challenge that we face is an opportunity to learn and to improve our lives. Can you tell me how many armed groups operate in your area, Waw Raw Township? There are KNLA, BGF [Border Guard Force] and Tatmadaw troops in Waw Raw Township. There are also many other groups who work with Karen armed groups. How many armed groups are there in your township? There are many armed groups in our area, such as BGF. What challenges do you face with the many armed groups operating in your area? All of the problems in my area are caused by misunderstandings among armed groups. What kind of problems do you have? Please tell me about them. We have to work together. We are Karen, so we work for Karen people. Most of the armed groups are Karen, but we also try to build good relationships with the armed groups who are not Karen. [Since] they [armed groups] are all active in Waw Raw Township, is there any problem between civilians and the KNLA? There is no big problem between civilians and us [KNLA]. We stand up for our people. It is because of civilians’ support, that we can still stand up now. How many villages and village tracts are there in your area [Waw Raw/Win Yay Township]? Regarding how many are villages [in our area], we have that information in our records, and we could find out if we check our records. If you want to know the information in detail, you can go and ask the administration officers. For us, we can only find it out [the number of villages] when we look at our [village] registration. What about village tracts? Can you tell me about it [how many village tracts there are in Waw Raw/Win Yay Township]? For me, I cannot remember the exact number, but we have the information [how many village tracts] in our record book. Can you tell me about Tatmadaw activity in your area after the ceasefire agreement was signed in 2012? There has been no notable [military] activity [in our area] after the preliminary ceasefire agreement was signed, but sometimes they [Tatmadaw] travel from place to place without letting us know. Sometimes they inform us if they travel. Some of the administrators [from Tatmadaw] inform [KNLA] but some do not. However, they have not done anything against us. Regarding their [Tatmadaw’s] activities, what do you think of it since you are an elder? Personally, I think some people think that the ceasefire agreement is [a guarantee for] peace, but other people understand it [the ceasefire agreement] more clearly. Some villagers doubt it [the ceasefire agreement]. [Their doubt is] based on their [Tatmadaw] activities and transportation because they [Tatmadaw] do not inform [KNLA when they are active or using the roads in KNLA areas]. As a result, villagers worry that the Tatmadaw is using the Nationwide Ceasefire Agreement [NCA] to trick villagers [into thinking there is peace]. Can you tell me about your opinion on the NCA? I think the NCA is good. We try to follow our leaders’ path in order to solve our political problems. It is not only the responsibility of the KNU [to build a good relationship with the Burma/Myanmar government], but the [Burma/Myanmar] government should also try to build a good relationship [with the KNU]. We should treat them [the Burma/Myanmar government] as a friend in order to move forward for our future. Can you tell me your opinions about the education situation in the past and now? If we look at it [the education situation], it [the improvement] is a sign of their [KNU and Burma/Myanmar government] collaboration. Many schools have been built in our area, because of the support received from many different [people]. There are many people who want to donate to and support our local schools. They have to improve the schools in the local villages depending on the pollical situation. Since local villagers were oppressed [in different ways impacting the quality of the education], they [people with financial means] have come to improve our local schools. Therefore, we must thank those who help to improve our schools. Sometimes villagers’ also help and provide resources to update and improve the schools because they [people from outside the village who support the schools] cannot do anything without villagers’ support. I heard there have been a lot of different issues in Waw Raw Township. 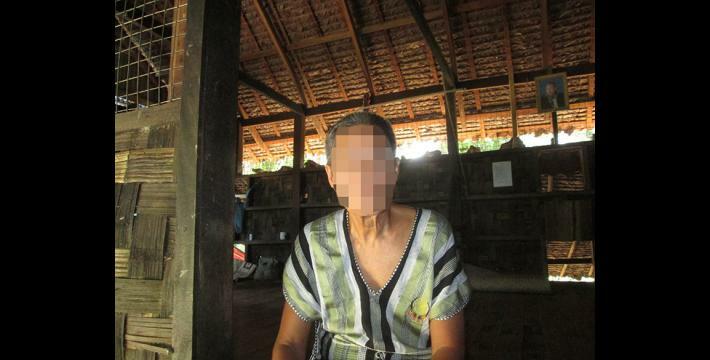 Local villagers felt frightened because the Burma/Myanmar government’s troops [Tatmadaw] who were on sentry duty interrogated local villagers. Regarding this, would you like to share your perspectives? At this time, we cannot only look at one side because the Burma/Myanmar government or its troops will do what they should do regarding their own security, but we need to understand them. We cannot judge them as bad based on one situation. Sometimes we have to work with them in order to move forward. If there is a problem between the Burma/Myanmar government and us, we have to call a meeting in order to solve the problem. When the case happened [local villagers were interrogated by Tatmadaw sentries], did it affect local students? Or did they have any other issues? Local children did not have any specific issues. Teachers [from Karen Education Department] and Burma/Myanmar government teachers both try their best [to improve the education system]. There are many Burma/Myanmar government teachers and KED teachers in our area. Sometimes we [villagers] worry about the relationship between the Burma/Myanmar government and KED teachers but they both try to improve the education system in our area. Also, they [Myanmar government teachers] in some cases help our villagers by giving us [opportunities] to learn about [our] community’s [Karen] culture, Karen language and Karen history. The KNU also helps villagers improve the community, so we will no longer have difficulties regarding education and healthcare. Thus, local villagers will be happier if all children [in B--- village] can go to school to study. How many schools does the Burma/Myanmar government recognise in Win Yay Township? Can you tell me about this? Now, we have to look at the situation. As I told you before, we have the number of schools in our records. If you want to know the details, you can look at our registry. Were there any KNU schools in Win Yay Township before the NCA was signed? As far as I know, in the past there were many KNU schools in many different areas, but now there are more Burma/Myanmar government teachers in our area, to improve our community. That’s why we do not deny them [Myanmar government teachers from helping our community]. We, KNU, also tries to improve the community, and it is like, “The more meat [you eat], the heavier [you get]” [Karen phrase meaning the ‘more opportunities you take to satiate your hunger, the stronger you become’ in this case referring to becoming stronger by working together for the sake of the community]. However, we have to work hand in hand with them [Myanmar government and Myanmar government teachers] in order to improve the education situation in our area. OK. Please tell me about your perspectives on business activities in your area? I have not seen any particular business activity during the ceasefire period, because the fighting has stopped and people’s fear about fighting has lessened. However, if we look at the situation in our area, there are things that can negatively affect our community such as drugs and alcohol. It is apparent that more and more drug users are in our area. Can you explain what kind of drugs [affect your community]? There are two types of drugs, strong drugs and soft drugs. A soft drug is like alcohol. However, if anyone uses either soft drugs or strong drugs in excess, it can create difficulties for people’s lives. Therefore, we try to be active in reducing drugs in our area. We educate villagers to become more aware of drugs and their negative side effects. We try to do as much as we can. Were there any development projects conducted in your area after 2012? After 2012, they [the Burma/Myanmar government] came to initiate development projects in our area and made plans to construct schools and clinics. Were the clinics built by the Burma/Myanmar government or the KNU government? I have already said that the Burma/Myanmar government led these development projects. We [KNU] have our own clinics, but we only have a few clinics. Some of the clinics were supported by other people, but some of the clinics we built ourselves. Regarding healthcare, does the KNU come to educate villagers about healthcare in your area? The KNU’s Healthcare Department [KDHW] and military troops [KNLA] do their best [to educate villagers about their health] as they have to fulfil their duties. Are there people who are poor, such as orphans, who cannot buy medicine, and other people who face issues like this in your area? Problems are everywhere. We also have problems in our area, but we try to solve them as much as we can. Now there are [many groups] who enter our villages in order to help villagers regarding healthcare issues, so I have not seen any serious illnesses in our area [because there are now people trying to help improve healthcare]. Sometimes if villagers get sick or need urgent medical assistance, healthcare workers try their best to solve their [health] problems immediately. What common diseases are there in Win Yay Township? In the past, the common diseases in Win Yay Township were respiratory disease and liver disease. I do not know what else to say about this. We become sick from the hot weather. There are many different diseases, but we see that malaria is the most common disease in our area. Do Kaw Thoo Lei [KNLA] army troops try to help children who are not able to study in the areas under your [KNLA] control? Currently, there are only a few students who cannot study. Now children’s parents are more open-minded, so they try to send their children to school. It does not matter whether they live in rural or urban areas; they try to send their children to school. As for the Education Department [KED], they plan to do their best for education because that is their responsibility. How do people earn their income in Win Yay Township? Mostly, people earn their living by doing agricultural work in our area. This is their main source of income. There are only a few people who buy and sell goods [traders/small business owners], but the majority of the people earn their living by working in agriculture. What type of agricultural work do they do? [Do they tend to work on] long term plantations or do they grow vegetables short term? Can you explain, please? Regarding agriculture, they [villagers] are working on the same farms that their great-grandparents used to work on. Now they [villagers] have long term plantations such as rubber plantations, and their livelihoods are dependent upon their rubber plantations. However, recently the price of the rubber has decreased, so people who work on rubber plantations have faced issues with their livelihoods. We have also seen that in some places paddy fields have become other people’s farmland. In the future, we, KNU, will try to prevent land confiscation. We set up a rule to keep the land for the next generation [the Karen youth]. However, [this rule doesn’t solve the current issue where] some people who work on rubber plantations for their income face issues because the price of the rubber has decreased [therefore they earn less]. So, some people work on rubber plantations in this area. Do rubber plantation owners have KNU land titles that are recognised by the Burma/Myanmar government? Please tell me if you know anything. In our area, the KNU is trying to make legal documents for villagers so they will have legal ownership rights to their land and have rights to work on the land so that they can claim their rights. What can the KNU do legally [regarding land rights]? Did they try to solve it [the issue regarding land titles] before 2012, or have they only started to do this recently? We [KNU] have tried to make it [legal documents for land ownership] in the past, but we must continue to make land titles to protect our lands, as our rights have been challenged by current political changes [where in some instances land titles issued by non-Myanmar government authorities have not been accepted]. We try to look after villagers’ lands, as we, KNU, have our own rules. Road construction has occurred in your area. Can you tell me what company is responsible for that [road construction]? There are many companies in our area, but we know that most of the companies are from Burma/Myanmar [national companies]. I think they [companies] get money [support] from Nay Pyi Taw. Myanmar companies work together with the Burma/Myanmar government to construct the road. Some lands beside the road have been destroyed by the road construction. So can you tell me who is accountable for that? As far as I know, regarding this [destruction], they [the Burma/Myanmar government] try to do their best to solve the problems. Some of the local authorities made a list of the damages and they reported it [the Burma/Myanmar government authorities], but I have not heard if villagers will get money [compensation]. Some [Myanmar companies] do not care if they expand the old road 100 feet wider than what was agreed upon. However, I have not seen them give money [compensation] to villagers and I also have not heard about it yet. Who permitted the Myanmar companies to expand the road by 100 feet? The KNU or the Burma/Myanmar government? The road was expanded after the Three Pagoda Pass road [National Highway] was constructed. However, the KNU did not agree to it. The problems surfaced because there had not been any agreement between them [Burma/Myanmar government] and us [KNU]. As you told me before, some officials made a list of land that was damaged and they reported it. Which organisation did they report it to? Burma/Myanmar government? Some officials from the Road Supervisory Committee [consisting of local authorities from the KNU and the Burma/Myanmar government] reported it to [Burma/Myanmar] government administrators. Who is the leader of the Road Supervisory Committee? Can you tell me? The leader of the Road Supervisory Committee is D--- and he is in charge of transportation in Win Yay Township. The road was constructed between 2012 and 2016. How much did it cost to construct the road? How much did road constructors receive? I do not know the information of how much money they used to construct the road. You will find those answers if you ask Road Supervisory Committee. What advantages and disadvantages does it [road construction] bring to local villagers? Tell me your opinion, please. In my opinion, it will be easier for villagers to travel if the road is of good quality. However, since the road makes it easier for people to travel, I also think bad people will also use this road to travel [e.g. for illegal trafficking]. Are there any issues for villagers? There are no particular issues in our area, but more and more cars and motorbikes will be used because of having better roads and some people do not fully understand traffic rules. Therefore, accidents sometimes occur. Regarding this road in your area, we heard that the Ministry of Construction has already recognised the 230 [rule], so I want to know how KNLA troops have helped villagers? What? [Can you explain] again? The Ministry of Construction released road rule ‘230’ and they [Burma/Myanmar government] confiscated local villagers’ lands, so I want to know how they [KNLA] plan to protect or help local villagers [from having their land confiscated]? For our KNLA, if they [the Ministry of Construction] informs us [about the rule ‘230’], we will know. If they do not inform us, we will not know. I have not heard about this rule ‘230’ that you’re speaking about. Regarding this road construction, did they [people constructing the road] consult with local villagers? Or did they explain it to villagers? To be able to make it happen [construct the road], they cannot build it by themselves alone. They established a Road Supervisory Committee in order to monitor the road construction. They had a meeting with villagers and responsible people. Responsible people from the Road Supervisory Committee tried their best in order to make the road happen. What did local villagers say about the road construction? Currently, local villagers do not have any particular issue to report. However, some villagers are not satisfied with the road construction because the road workers built an arch-bridge over a stream which caused the water to flow in the wrong direction, and now the water does not flow as it should. Villagers have reported these sorts of things. Presently, what companies are active in your area? Who is the chairperson of the company? Can you tell me? I do not know exactly which companies [operate in our area] and who the chairpersons are. If you want to know, you can ask Road Supervisory Committee. As you told me before, there are construction workers [from the Burma/Myanmar government] in your area. So can you tell me who is in charge of the construction? Where does he live? I do not remember the name of the person who is in charge of construction. In order to construct the roads and bridges or anything, they simply form a group of construction workers to make it happen. What challenges did KNLA face in your area between 2012 and 2016? Sometimes we experienced challenges in our area because we tried to build trust with the Burma/Myanmar government when there was not much understanding between us. So we must plan to build a good understanding [between us] as much as we can. However, both of us [KNLA and Burma/Myanmar government] do not trust the other fully. I heard that a cement factory will be constructed in your area, but I do not know where it will be located. Please tell me if you have heard anything about it. There is only a proposal for a project to build a cement factory in our area. For us, we are trying to prioritise villagers’ wants and perspectives. If it [the cement factory] will benefit villagers and if villagers want to have it, we will let them [the companies] do as they wish. Our understanding is that we have to tell [inform] local villagers about how it will affect our community. Local villagers are now open-minded [to development projects]. Concerning the cement factory project, we will have to explain to villagers how it can affect our community, but until now we have not allowed any development projects in our area. Do they [companies] have permission to survey the area to test [if the soil is conducive for cement production]? Where they can go and survey depends on what permission we give them. If we do not permit them to go, they cannot go and test. If they try to implement any development project, we must give a chance for villagers to decide. If the development project is not useful or beneficial for villagers, we must reject it immediately. I heard that there is a dam project underway in Win Yay Township? Is that true? Can you tell me more about it? I have also heard about it [the dam project], but I do not know for certain whether they have already begun construction of the dam or not. Can you tell me about where they will plan to construct the dam? I do not know exactly where they will construct the dam. For example, if they construct a dam, they have to inform us. If they do not receive permission from us [KNLA] and local villagers, then villagers will reject the dam project. Would you like to say anything about something that I have not asked you? What I want to say is that in my area there are no urgent issues. As we mentioned before, our greatest challenge is the issue of drugs. As for other issues, our leaders [in the KNU] and the Burma/Myanmar government do not have a reliable plan to solve our political problems. Both groups do not trust each other fully. Until now, we have had to live very cautiously. What [can you tell me] about problems within the communities in Win Yay Township from the past compared to now? Can you tell me how it is different? Presently, the situation is getting better. However, the people in our community have to be aware of the situation because villagers are facing food insecurity from infrastructure development. The food is not produced naturally [anymore] and [everyone uses] chemical fertilisers instead. Therefore, in the long run, it will negatively impact villagers’ health. Currently, Tatmadaw troops are active nearby villages and religious areas. So, how far do you want them to stay [re-locate] away from villages? Can you give me your views on it as you are a KNLA Battalion Sergeant Major? If we look at army troops’ policy [as stipulated in the Nationwide Ceasefire Agreement], they have to stay within the areas stated in their policy. However, we also want them to abide by our wishes [and not be active near us], but we cannot do anything about it because we do not have the authority to order them to do this. We have to understand the situation as it is. For example, to keep the area peaceful, they [Tatmadaw] should stay in their camps such as Noh Su Naw army camp and Lay Naw army camp and we do not think it is appropriate for them to be active near to villages. So how far away would you want them to stay from villages? Can you tell me your perspective on this? It would be better if they move their army camps to another location, but we have to consider our NCA rules between us [which allow their army camps to be based in certain areas]. So we both have to follow the rules since the NCA has been signed. I think our leaders know about this situation better than us. So do you want to say anything that I have missed? After we finish our interview, I would like to take a picture of you. Can you tell me how we should use your picture and this audio interview? I do not have any suggestion to give you regarding how to use my picture and audio interview. It depends on their [KHRG] guidelines, how they should use it. It is fine to use as long as it does not dishonour our area. During this interview both interviewee and researcher use Waw Raw and Win Yay interchangeably to refer to the same township. The Karen National Union's Education Department. The main goals of the KED are to provide education, as well as to preserve Karen language and culture. During the civil war in Burma/Myanmar the KEDbecame the main organisation providing educational services in the KNU controlled areas in southeast Burma/Myanmar. The KED also previously oversaw the educational system in the seven refugee camps along the Thai-Burma/Myanmar border, however in 2009 these activities were restructured under the Karen Refugee Committee – Education Entity (KRCEE). See "Conflict Erupts over Govt teachers deployed to KNU areas," Karen News, August 20th 2013 and the KRCEE website: "About," accessed July 21st 2015. Naypyidaw (also spelled Nay Pyi Taw) is the capital city of Burma/Myanmar. In 2005 the military regime moved the capital from Rangoon to a greenfield at its present location, 320 kilometers (200 miles) north of the city. In this interview, the interviewee is referring to the Burma/Myanmar government, who are based in Naypyidaw. This rule, locally known as ‘230’, is said to come from Ministry of Construction information that for road construction in this area, land will be built on up to the width of 230 feet along the length of the road. This width of land taken would cause significant disruption, damage and loss to villagers’ lands. However, the details of such road construction and whether this rule is indeed accurate remain unconfirmed.